Few franchises have seen the tremendous growth that the Chicago Bulls enjoyed during the 1990s. That dynasty was led by Michael Jordan and Scottie Pippen and put the Bulls on the same level as the most popular professional teams in the world. While the team has not been as successful since then, the Bulls are again among the strongest teams in the league and the fan base remains large. The following shopping guide was created to help with buying holiday and birthday gifts for the many fans and collectors of the Bulls. 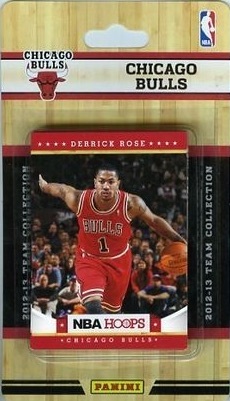 Collectors who are looking for more detailed information about the team and the many collecting options should check out our Chicago Bulls Collecting Guide. 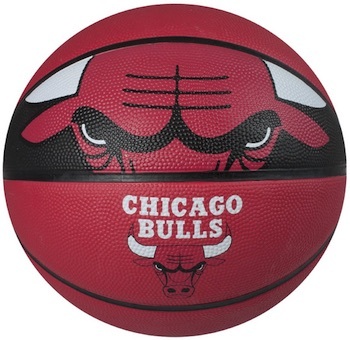 The guide below includes 20 different gift ideas, all of which would appeal to a fan or collector of the Chicago Bulls. Specific items and broad suggestions are featured and items across all budgets are included in this helpful shopping guide. While Dennis Rodman's career with the Bulls was relatively short, it was still quite memorable and included three NBA titles. 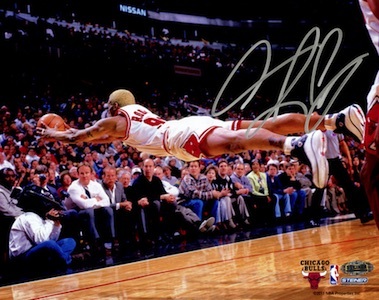 The signed photograph below perfectly shows what Rodman brought to the team. Although he was a diva off the court, Rodman was the ultimate team player and remains a fan favorite. The masses tend to forget what Scottie Pippen contributed to the Bulls, but basketball fans know how instrumental he was to the team's success. Jordan might have been the face of the team, but Pippen was a main reason that the Bulls finally saw their title run begin. A signed basketball for Pippen is a great gift and ideal for display in a man cave. 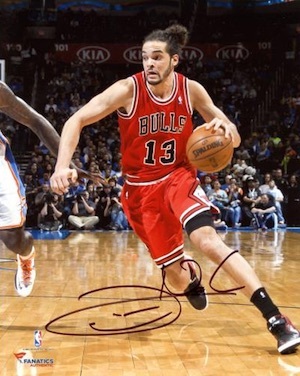 A main part of the current squad, Joakim Noah is a defensive force and a passionate player. This signed photo from the former Florida Gator would make an appealing gift that won't hurt the wallet too bad. Injuries continue to be an issue, but when Derrick Rose is health, very few in the league can match his speed and skill. 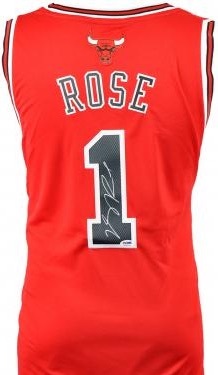 A signed jersey for Rose is a terrific premium gift and can be framed to make the ultimate display piece. 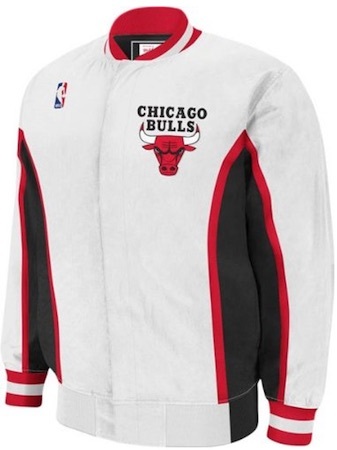 Not all the Chicago Bulls greats command high dollars for their signed gear. 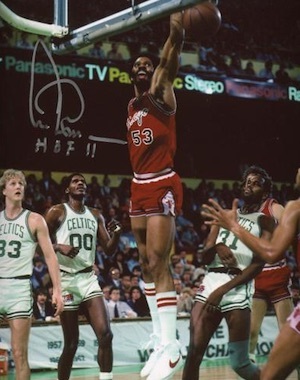 Artis Gilmore is a Hall of Fame player and one of the top players in Bulls history. His signed photos can be found for budget prices and would be a nice gift for a seasoned fan of the team. Featuring a classic look and specific headlines from the team's history, this subway sign is an ideal gift for display in a man cave, office or bedroom. 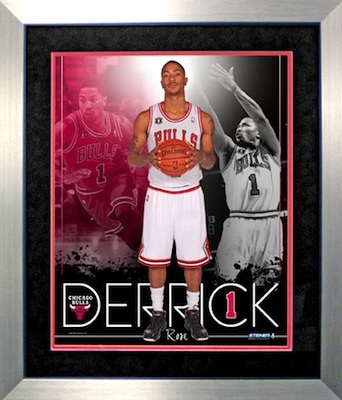 If you are looking for something that has a quality look but don't want to shell out big dollars, this collage features three images of Derrick Rose and is housed in a silver frame. 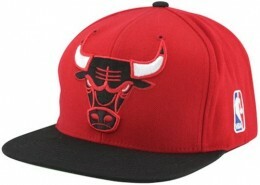 Michael Jordan is the Chicago Bulls. However, his signed gear runs about the same amount as a mortgage payment, so most should not expect his signed gear under the tree. 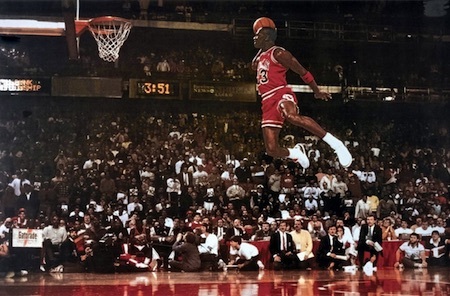 This poster is classic Air Jordan and offers an appealing budget option for display in almost any setting. 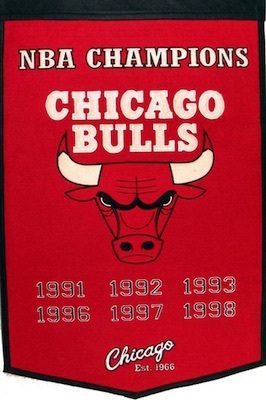 Another item that would work almost anywhere, the Bulls owned the 1990s and this banner celebrates that fact with each title year noted. 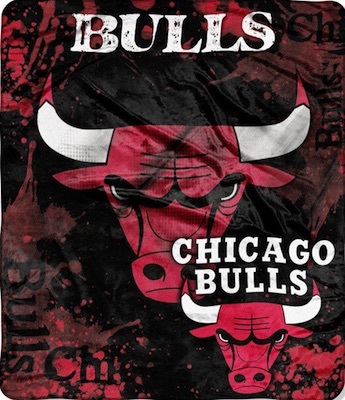 The wool banner offers a solid gift option for any fan or collector of the Bulls. There is no better gift for a fan of the team from the Windy City than a warm blanket. This fleece blanket is a useful way to support the team and a fun gift. More subtle that most signs, this garden flag brings a touch of class to any yard and showcases the Bulls without being an eyesore. 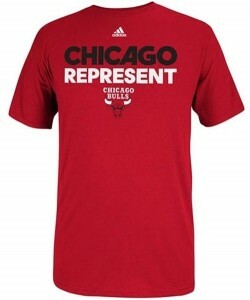 Featuring a large team logo and heavy on red, a Chicago Bulls basketball is a nice budget gift and can be paired with the blanket and/or the garden sign for a simple team gift pack. Basketball cards are a popular option for fans, but they are not as simple to buy because they are so specific. 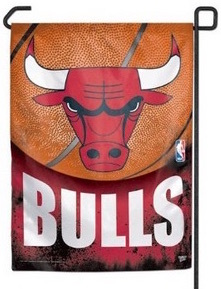 One option we recommend for budget gifts or stocking stuffers is Chicago Bulls team sets. Some are sealed and some are hand-collated, but the result is the same. Make sure to verify the year of the card and the players included to make sure you are getting what you expect. 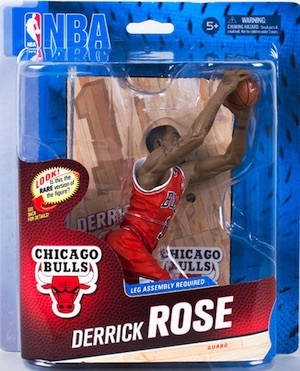 Whether shopping for a child or an adult, Chicago Bulls figures and bobbleheads can be a great gift. Several different brands offer a variety of options and many players can be found from the history of the franchise. Check out specific figures on eBay using the links below. There are a good variety of different Chicago Bulls team fatheads. In addition to team logo versions, players are some of the top Fatheads and two of the most popular Bulls are noted below. 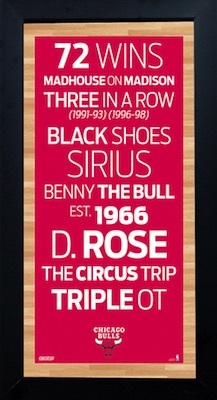 Smartphones are the new norm and can make for an easy and inexpensive gift for a Chicago Bulls fan. Just make sure to verify the exact make and model before you buy. We have included direct links to Amazon below for the most popular phone models. 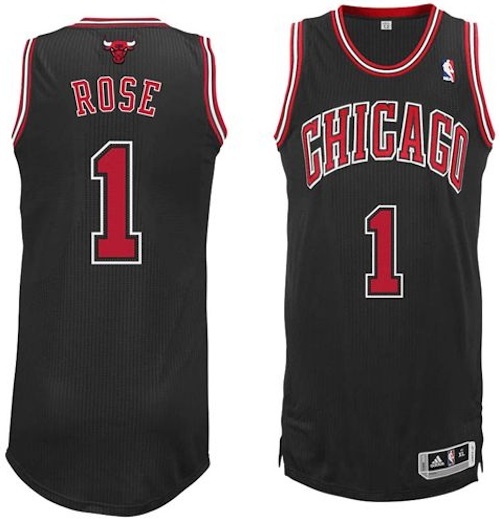 Jerseys remain the most common way for fans to display their love of the Chicago Bulls. Replica versions offer cheaper prices and fans can also have them customized for added appeal. If you are overwhelmed by the many versions, check our detailed NBA jersey guide here.